At The Orlow Firm, our New York City personal injury lawyers have helped injured clients in NYC since our firm was founded over 30 years ago. Were you injured traveling to or within NYC? Did police use excessive force when handling or arresting you? Perhaps you were you injured at a New York City retail establishment or while working at a NYC construction or industrial site? Whatever grounds your case may fall under, our NYC personal injury lawyers can help. Have you been injured in NYC or in any New York City borough? Contact our New York City personal injury attorneys of The Orlow Firm at (646) 647-3398. Having handled thousands of personal injury cases, our NYC personal injury lawyers are highly efficient and skilled in investigating on-the-job, dangerous property and motor vehicle accidents, and all other types of accident and injury claims. Our diligence and experience have resulted in many millions of dollars in compensation for injured NYC-resident clients. For a no-charge consultation regarding your potential claim, contact one of our four New York City offices. What areas do you service in NYC? Why Hire The Orlow Firm? Free consultations and Case evaluations. When you contact us one of our secretaries will take down the basics details of your case in order to open a file. Once the file has been opened you’ll be transferred to a partner to further discuss your case and determine the next steps to move forward. By speaking directly to a partner about your case, you can be assured that you’re receiving qualified and experienced advice from your very first phone call. No win, no fee. 100% Contingency basis. Of course we would never charge you anything upfront, but another important aspect about our firm is that in the course of your case there may be additional costs along the way such as hiring an investigator or expert testimony. We will never ask you to foot these bills we will only reimburse our expenses once you have won your case. We consider it our job to help you make informed decisions throughout the process. We will offer guidance and advice at every decision, but we will never pressure or make you feel obligated to make a decision that you do not feel right about. If you want a quick settlement, we can handle that for you. If you want to go to trial, we’ll be there every step of the way. We are a family firm. We are a father & sons team. 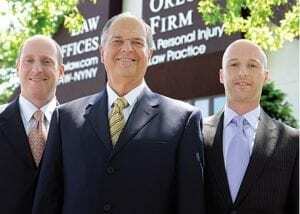 Steven Orlow started the firm in the early 1980s and has been practicing personal injury law ever since. His two sons, Adam & Brian, joined him and we all work together closely. Each case that our firm handles has three sets of eyes on it throughout the process to make sure nothing is missed. At The Orlow Firm, we also offer free initial consultations, handle cases exclusively on a contingency fee basis and can come to you if you cannot come to us. To contact our firm, call (646) 647-3398.